Lotus 3-Eleven: "Most powerful car to wear a Lotus badge"
Lotus is releasing, what will no doubt bring up the over-used description, “spiritual successor to the Lotus 7” or Eleven. Lotus claims the ultra-rare roller skate will be able to reach 60 mph in less than 3 seconds and hit 100 mph in no more than 6 flap-your-jowls-clean-off seconds. According to Lotus the 3-Eleven (not 311, not 3-11, 3-Eleven) will weigh in at 890 kg/ 1962 pounds with 490hp propelling the race version. The road version will weigh in at a bit more at 925 kg / 2039 pounds and have 410 horses dragging it along to 60 mph in a mere 3.3 seconds. The open coupe should hit 174 mph. Lotus claims the car will be a sub-7 minute car around the Ring in prime conditions. Production will begin soon limited to 311 copies pushed out the door. Prices start at £82,500 for the Road version (including VAT and on the road costs) and £97,083 excluding VAT for the Race version (£116,500 including VAT). 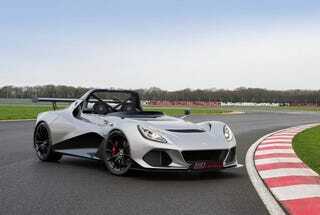 The 3-Eleven will be sold in all markets as a Race car and in Europe and Asia as a Road car. Photos courtesy of Group Lotus plc.